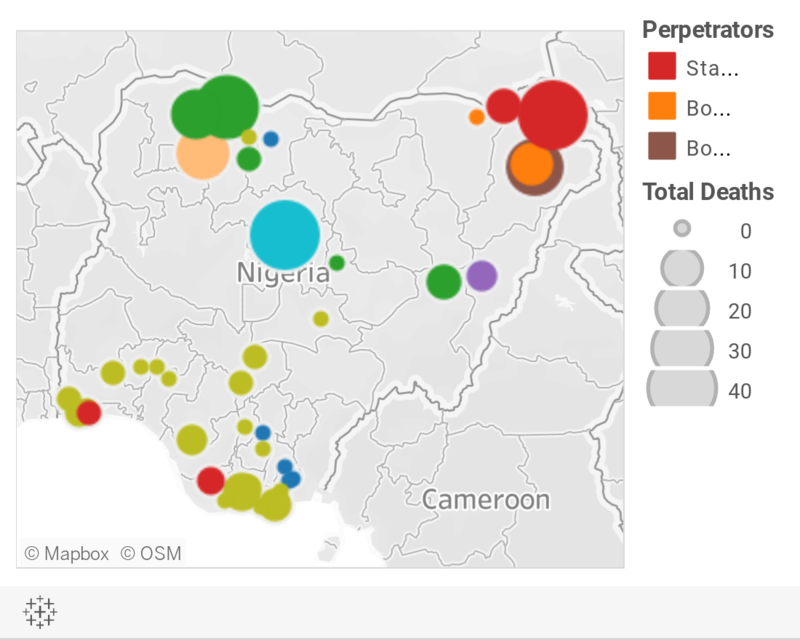 Below is a visualization and description of some of the most significant incidents of political violence in Nigeria from February 23 to March 1, 2019. This update also represents violence related to Boko Haram in Cameroon, Chad, and Niger. These incidents will be included in the Nigeria Security Tracker. February 23: Boko Haram attacked Maiduguri, Borno, killing one soldier. February 23: Boko Haram attacked Geidam, Yobe. There were no reported casualties. February 23: One soldier and six civilians were killed in election-related violence in Akuku-Toru, Rivers. February 23: Four were killed in election-related violence in Andoni, Rivers. February 23: Bandits killed the APC ward chairman in Chafe, Zamfara. February 23: Three were killed in election-related violence in Sapele, Delta. February 23: One was killed in election-related violence in Ibadan, Oyo. February 23: Election-related violence resulted in one death in Dekina LGA and one death in Igalamela Odolu LGA in Kogi. February 23: An election official was killed in Degema, Rivers. February 23: Soldiers killed two in Southern Ijaw, Bayelsa. February 23: Gunmen abducted ten corps members in Abak LGA, four in Itu LGA, and four in Ikono LGA in Akwa Ibom. February 23: The Nigerian Air Force killed "several" (estimated at five) Boko Haram militants in Mobbar, Borno. February 24: Gunmen killed five in Karim Lamido, Taraba. February 24: The Nigerian Air Force killed "scores" (estimated at forty) of Boko Haram militants in Kukawa, Borno (LGA estimated). February 24: Gunmen killed a policeman accompanying election results in Egbado South, Ogun. February 24: An Independent National Electoral Commission (INEC) official was kidnapped in Safana, Katsina. February 24: The Bayelsa deputy commissioner of police was kidnapped in Brass, Bayelsa. February 26: Gunmen killed forty in Kajuru, Kaduna. February 26: Bandits killed sixteen and kidnapped six in Rabah, Sokoto. February 27: Bandits killed fourteen and abducted forty in Anka, Zamfara; soldiers killed five of the bandits. February 27: One was killed at Buhari's victory celebration in Lagos Mainland. February 27: Two were killed during Buhari's victory celebration in Ojo, Lagos. February 27: Nigerian soldiers killed three during Buhari's victory celebration in Numan, Admawa. February 28: Three soldiers, one civilian, and "many" (estimated at twenty) Boko Haram militants were killed during a clash in Jere, Borno. February 28: Bandits killed sixteen CJTF and sixteen others in Shinkafi, Zamfara. February 28: The Islamic State claimed to have killed ten Nigerian soldiers in Tdmari, Borno (no LGA given). March 1: Herdsmen killed one in Numan, Adamawa.